The historically significant Rustenburg is a primary agricultural region with vast citrus estates. Platinum mining in Rustenburg began in 1929 and the world's largest platinum refinery, PMR (Precious Metal Refiners), processes around 70% of the world's platinum. Rustenburg is the fastest growing city in South Africa. Rustenburg High School has the most provincial athletes of any school in South Africa with the Rustenburg Judo Club winning the most medals of any single club in South Africa in SA National Championships over the last 15 years. Rustenburg has produced a bank robber and international sportsmen, artists, singers and a former minister. Many Anglo-Boer and ethnic war battles took place in the area with many prominent battlefields, memorial graves and ruined forts still visible. Archaeological remains from the Iron Age and Stone Age are abundant. There are three large nature reserves, one being almost half the size of Belgium and another being the fourth largest in South Africa. Sun City and Lost City form one of the largest casino complexes in the world. 2 new job listings for this search have been found in the last calendar day, compared with 6 in the last 72 hours and 53 in the last week. 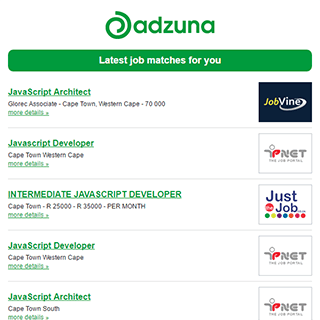 The Adzuna recency index score for this search is 0.26, suggesting that demand for current live jobs in Rustenburg is decreasing. Companies presently offering current live jobs in Rustenburg include King James, Clicks, Dis Chem Pharmacies..
Get the latest Jobs in Rustenburg delivered straight to your inbox!